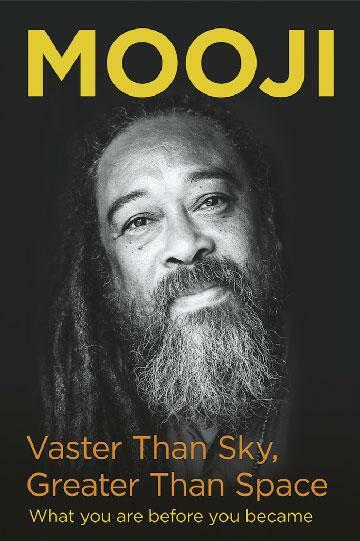 We are delighted to announce that Mooji’s profound book, Vaster Than Sky, Greater Than Space will be published by Hodder & Stoughton in the UK on 5 July. In celebration of this release, Mooji will also be offering two Satsang events in London, UK. 9 July: An Evening with Mooji | Waterstones | More info here. 12 July: Satsang with Mooji | Alternatives | More info here. This book is for anyone who is searching for lasting happiness, peace, and love—for Truth or self-realisation. The teachings and insights offered are sublimely simple and the place they lead the reader is beyond words. You don’t need to learn any complicated techniques or practices, for the method of self-inquiry is like looking into a mirror and recognising your timeless face. This way of looking into the truth of our existence is simple, direct and powerful. Rich in wisdom and insights, and filled with the openness, love and humour that Mooji exudes, Vaster Than Sky, Greater Than Space also contains many of Mooji’s favourite teaching stories, sayings and brush drawings. This book has the capacity to guide the reader into the direct experience of their true nature, while also addressing questions concerning our place in the world, relationships, family, work and difficulties in life. Drawing on direct experience and ancient spiritual wisdom, Mooji offers the master key to go beyond personal limitations and discover our essential being—revealing the lasting happiness, peace and love that are inherent in our natural being.